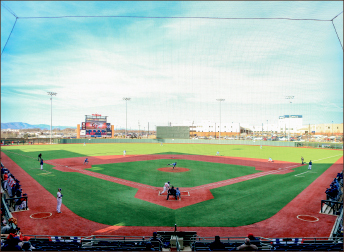 In the early 1970s, a young Liberty University unveiled the plans for a baseball program. Only a few years later,the team took the field with former MLB pitcher Al Worthington at the helm. Worthington only registered one losing season during his 13-year tenure as the Flames coach. He finished coaching in 1986, which is when Liberty’s baseball stadium was named after him. He ended his career with a winning percentage of 64.4, according to libertyflames.com. And in 1983, he became the fifth athletic director in Liberty’s history. A bust of Worthington now sits in front of the new $8 million Liberty Baseball Stadium, the new home of a program that has produced more than 60 professional athletes who have been drafted by MLB teams and defending Big South champions. In 2007, former head coach for the Flames Matt Royer resigned. He coached for five years and took the team to the Big South Championship in 2006. Athletic Director Jeff Barber began the search for Royer’s replacement in his first year as athletic director. Barber held a position involved with athletics at the University of South Carolina and while he was there, he remembered meeting a man named Jim Toman. Barber also said Toman is known for his phenomenal recruiting, which was another factor he took into consideration when he hired Toman. Toman had many years of coaching experience before he joined the team, as he coached for North Carolina State University and the University of South Carolina for more than 20 years. He said he was not looking for a head coaching job while he was with the Gamecocks, but something about Liberty was very appealing to him. All that Liberty had to offer, including a Christian environment, inspired Toman to come to Lynchburg. He had three kids who were not in their teens yet and wanted them to be in a school like Liberty Christian Academy, which is where they currently attend. But he was also drawn to the baseball program and the possibilities that came with it, as they were coming off a loss in the Big South championship game. He said the program was in a good state, but it, along with the facilities, needed some improvement. To make the changes, Toman did what Barber said Toman does best. He recruited. 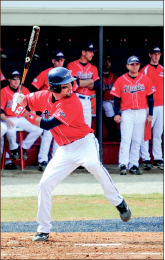 One minor recruiting setback the baseball program had to deal with was the very thing that brought Toman to Liberty — its Christian rules and environment. Both Toman and Barber explained that certain athletes do not want to go to a school with the rules that Liberty puts in place. Despite potential setbacks, Liberty was able to bring in enough talent, including the 2013 class that baseballamerica.com described as the “deepest and most balanced” in Toman’s tenure, to win. He credits some of the recruiting success to the new baseball stadium, which opened last year. The investment has been used as a recruiting tool and has worked well, according to Toman. Each year since Toman’s arrival, the Flames have had a winning record and contended for the title, which is what Barber was looking for when he made the managerial change. The Flames are currently 35-10 and have beaten teams such as Duke University and Clemson University, which is currently the No. 20 team in the nation. They lead in multiple statistical categories in the Big South Conference, and the team is currently the No. 22 team in the nation. They are also currently the No. 1 team in the conference, and the team looks to defend its title in the Big South Championship tournament May 20-24 at Winthrop University in Rock Hill, S.C.